Does the back of your car look like this? Ours does. All the time. Actually it is usually much, much worse and includes such delights as old apple cores, dried out half eaten sandwiches and a sultana or two (hidden in just about every crevice). Gross, disgusting and embarrassing, especially when said "stuff" falls out in the school parking lot! Anyway, try as I might I just haven't been able to keep the car tidy and the messier it gets the messier it tends to get - the whole "if you can't beat 'em, join 'em" thing. And whilst the little pockets at the back of the seats are great, they don't tend to hold too much, nor cope with the odd dragon or truck trying to be stuffed in. And my Dad telling me how much of a pigsty my car is ("I can't believe you girls! Your houses are immaculate but your cars are disgusting" he has said on way more than one occasion) hasn't helped matters. So, Dad, this project is for YOU! Even though, of course, you will never read a post in your life or in fact even know what a blog is. So, what did I decide to do? 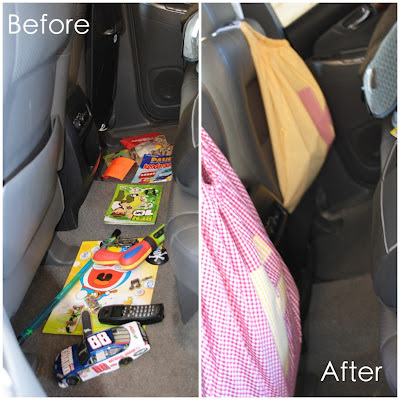 Throw out all toys and not allow them in the car again? Get a two-seater sportscar (ooooo, tempting) in which the kids don't fit? Ignore it? If you know me, you would know that is pure crazy talk. No. 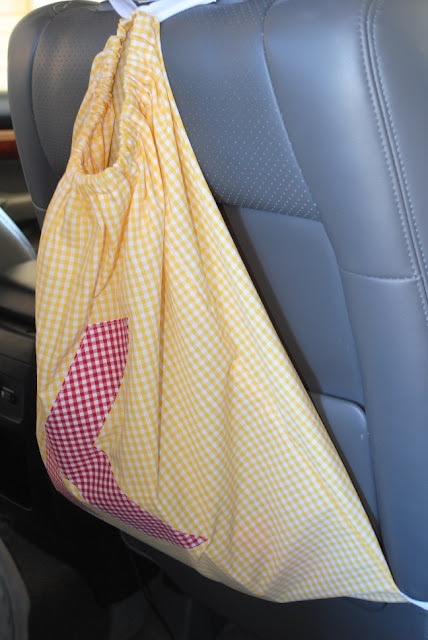 The answer came in the form of the "Car Seat Catchall" (sorry, couldn't think of a clever or cute name). It's a big 'ol sack with an elasticated opening that has straps at the top and the sides to attach to the back of the seat. 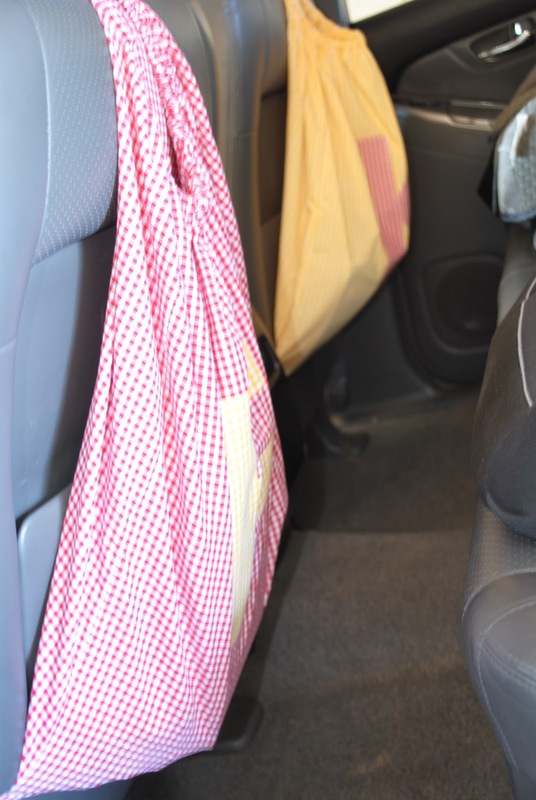 Its sole purpose is to stow away all the toys (the books, the dragons AND the trucks ... the apple cores and sultanas will be dealt with separately) very easily and quickly, keeping the car clutter-free, clean and tidy and just generally a nicer space to be in. It also makes for a much happier, saner and less red-faced Mumma ... who at 40'ish is still trying to please her Dad!!! The sacks were very simple to make. I chose fabric from my basket - I was adamant I wasn't going to purchase more. 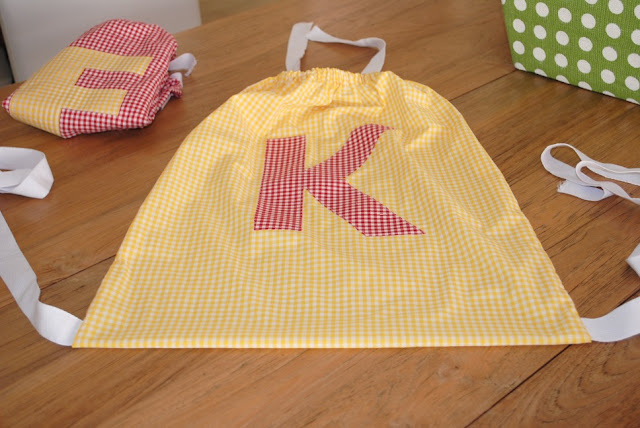 To personalise the bags, I added the initials of my kids - F & K - mainly just for fun & cuteness! I used my Silhouette Cameo to cut out the letters but you can easily cut fabric letters by printing a template on paper and then tracing onto your fabric, which I have always done in the past. I then just folded over my fabric into a rectangle, sewed up the sides, added a casing at the top for the elastic and included straps at the top and at the sides (I added these before sewing up the sides and triple stitched them so they'd hold up to the hefty dragons and trucks). And that was it. Very simple, and they were a breeze to attach to the seats. Basic but functional. How about you? 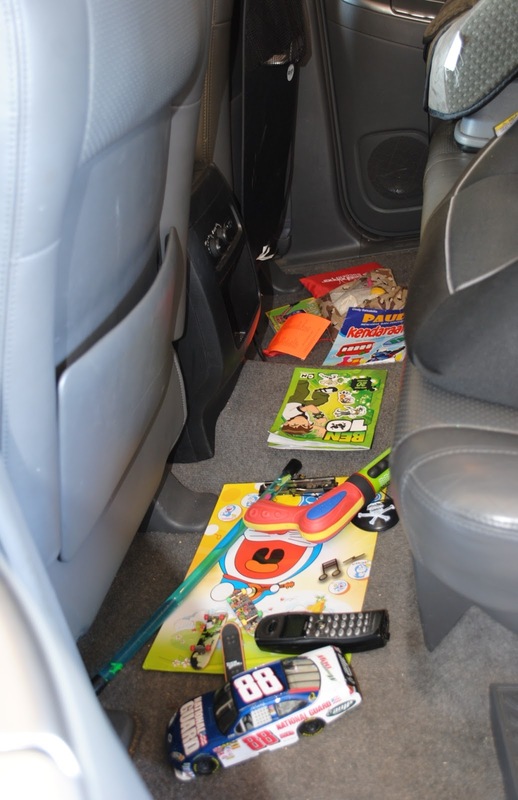 Does a messy (read "pigsty") car send you loop-di-loop, or are you able to ignore it and accept it's all part of having sticky little people and all their sticky "stuff" with you 24/7? 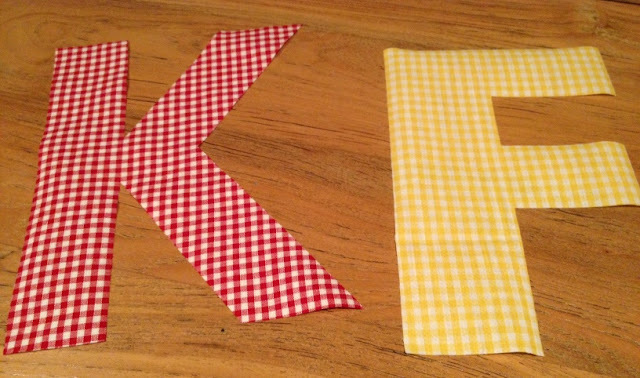 Can I ask how you attached your letters to the bag?